Chester-based C&C Catering Equipment has completed another large scheme in the capital, this time for the Tate Modern art gallery. 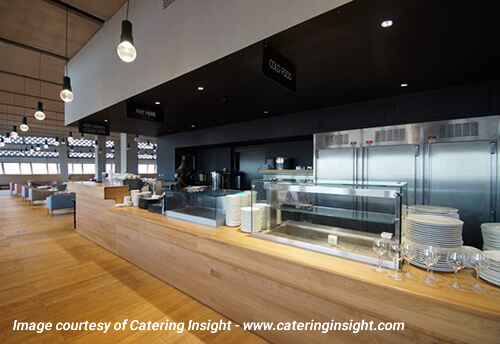 The London landmark required catering facilities to serve its visitors and members, and following a significant tender process, C&C Catering Equipment was awarded the mammoth project, which spanned work over seven floors. This included multiple bars, bar café areas, a main kitchen serving the restaurant, and coldrooms. Brands on the scheme included Select, Counterline, and Green Cooling. Working with consultant, SHW Design, the size of the project and particular features at Tate Modern created challenges for the C&C team, such as protocols, time restraints and weather related issues, all of which the distributor reported it overcame to provide a high-quality scheme. Strict protocols on site and the detail specific areas created some timing issues; however C&C was able to solve this through careful planning. This included unique timber clad servery counters, which required coordination with the shopfitter to ensure a high-standard of continuity and timber finishes across the site. Additionally, due to the building’s former life as an old power station, the sensitivity in fluctuating temperatures caused movement in the natural materials, including a solid wood bar, which was found to shrink and expand. However the team were on site to ensure that all materials, whether natural or manmade, were finished to a very high quality. Paul Parry, project director, added: “We’re very pleased with the outcome at Tate Modern, especially having gone above and beyond what we normally do on a job. This has included undertaking all of the high to low mechanical and electrical services and some ductwork off extract hoods.